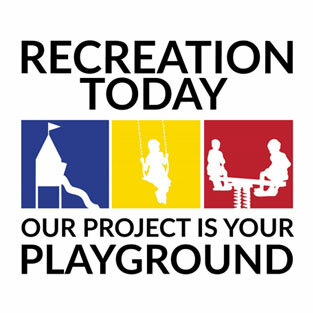 Recreation Today can provide you with a Buddy Bench Rules Sign to install beside your Buddy Bench. 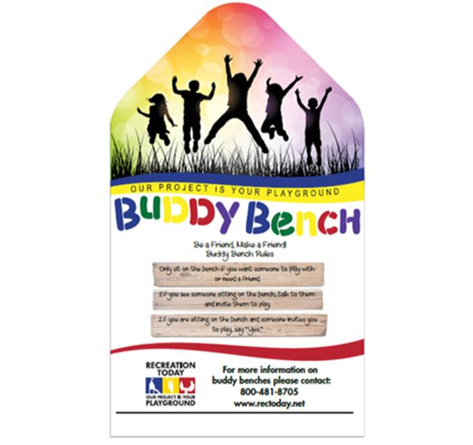 This sign provides information about your Buddy Bench and why you have provided the Buddy Bench for your organization. Only sit on the bench if you need someone to play with or need a friend. If you see someone sitting on the bench, talk to them and invite them to play. If you are sitting on the bench and someone invites you to play, say “Yes”. *Optionally, you may add one additional rule of your own. We will match the color of the posts on your Buddy Bench Rules Sign to the color of your Buddy Bench. The cost of the 24″ x 14″ Buddy Bench Rules Sign with posts is $475, plus shipping and handling. Ask someone else to play with you first, it’s important that children get comfortable using their words. Don’t forget to smile and be friendly. Before or while you’re sitting on the Buddy Bench, think of something you would like to do. If you see something you want to do or a friend you want to talk to, get off the bench! Don’t forget to include your Rules Sign when you request a quote for your Buddy Bench!